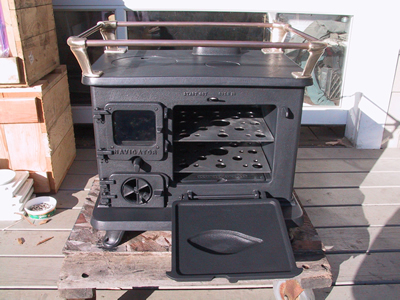 HALIBUT COOKSTOVE INFO & SPECS. Navigator's Model # NSW3. "HALIBUT"
Based on the old East Coast favorite from the USA . 15.5 to top of cook surface with legs. 18.5 to top of cast bronze sea rail. - Cast Bronze Sea Rail Cornerposts with 1/2" brass rails. - SS Oven thermometer, adjustable SS oven rack, full circular "oven mode" flamepath. - High Temperature Glass Window in Firebox Door. - Uses 4" Chimney Pipe (10 Cm). - Approx. Output: 25-35,000 Btus. - Plain Iron or Porcelain Enamel (std. & custom colors). - Compatible with our bronze "Drop-In" Burner Modules! "Hi there sorry its been so long. Been way too busy. Business is really going well. Hopefully picked up a steel carrying contract next Summer running steel from Birmingham to London on the Grand Union Canal. (about 250 km so not far in America but quite a distance in Britain). Should do one trip every 3 to 4 days. Cool. Stove burning beautifully. Its on almost 24/7 so working hard. Great burn control - I loaded it up last week and when I finally got back in about 24 hours later, it was hot enough to get some kindling going with a bit of blowing! Nice. 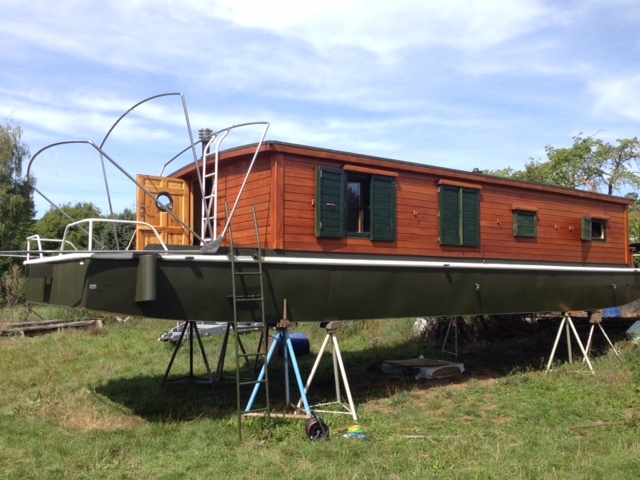 Heats the boat easily and the oven works properly." "I finally made it back home and unpack my Red Halibut. I wanted to post my thoughts so all could share. First off I want to thank Andrew for his persistence in getting the stove done. The process was lengthy but as Andrew said on his web site, what is a year to wait for something that will last more than a lifetime. I opted for the Red porcelain which was a bit pricey but well worth it to me. Overall the stove has exceeded my expectations. I do not know what the old red porcelain would have looked like but the new darker red looks really classy. It is kind of a brick red or maroon which blends nicely with the brass and bronze sea rail and hinges. It is a great way to have a red stove and not have it look like a fire plug. 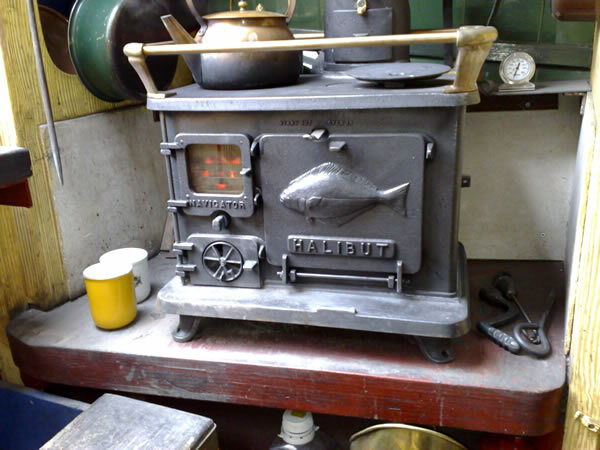 In my opinion the craftsmanship is outstanding and the stove is the perfect size (physically) for my 32ft LOD wooden Gaff Cutter. After I install the stove I will post again about it's heating ability. Again, I want to thank Andrew for his efforts and for providing such a timeless product in such a disposable world. 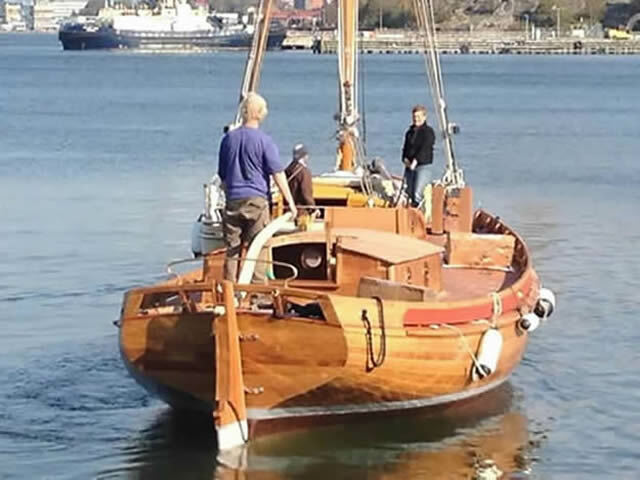 It was a pleasure working with him and I look froward to future exchanges as I order the parts for the chimney, etc." *This unit is not a certified residential wood heater. For portable and temporary use only. 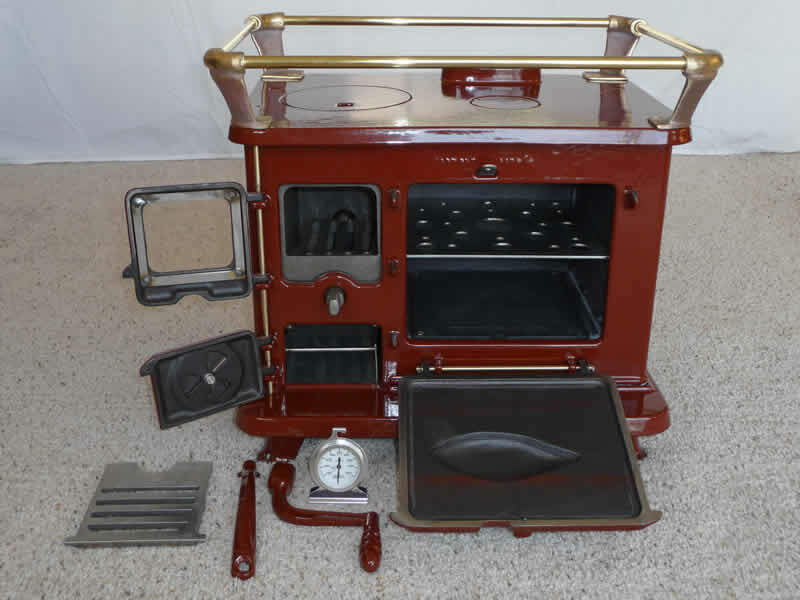 EPA's new Camp Stove Definition = "a portable stove equipped with a pipe or chimney exhaust capable of burning wood or coal intended for use in a tent or other temporary structure used for hunting, camping, fishing or other outdoor recreation. The primary purpose of the stove is to provide space heating, although cooking and heating water may be additional functions." additional 2 each side to access turnbuckle hold-downs. Copyright 2016 NSW, Inc., all rights reserved.